New York City isn’t immune to earthquakes; a couple of small tremors measuring about 2.5 on the Richter scale even struck back in 2001 and 2002. But on August 10, 1884, a more powerful earthquake hit. 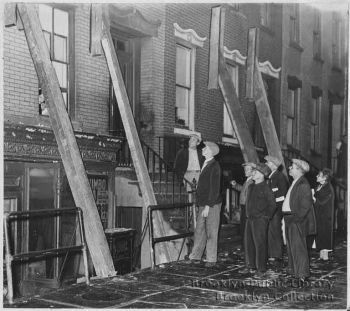 Estimated from 4.9 to 5.5 in magnitude, the tremor made houses shake, chimneys fall, and residents wonder what the heck was going on, according to a New York Times article two days later. The quake was subsequently thought to have been centered off Far Rockaway or Coney Island. It wasn’t the first moderate quake, and it won’t be the last. In a 2008 Columbia University study, seismologists reported that the city is crisscrossed with several fault lines, one along 125th Street. With that in mind, New Yorkers should expect a 5.0 or higher earthquake centered here every 100 years, the seismologists say. Translation: We’re about 30 years overdue. Lucky for us the city adopted earthquake-resistant building codes in 1995.